Although the European Commission has turned off the slapping machine (using sanctions against Hungary in its excess deficit procedure), it is not taking it out of the room, to let Hungary know where it stands. According to the Commission, the reasons for the increase of the Hungarian deficit in 2014 are the postponement from 2013 of increasing teachers’ pay through a new compensation scheme and rising interest expenditures. While the figures for 2012 are the best in the region, the situation will reverse over the next 2 years according to their forecasts. 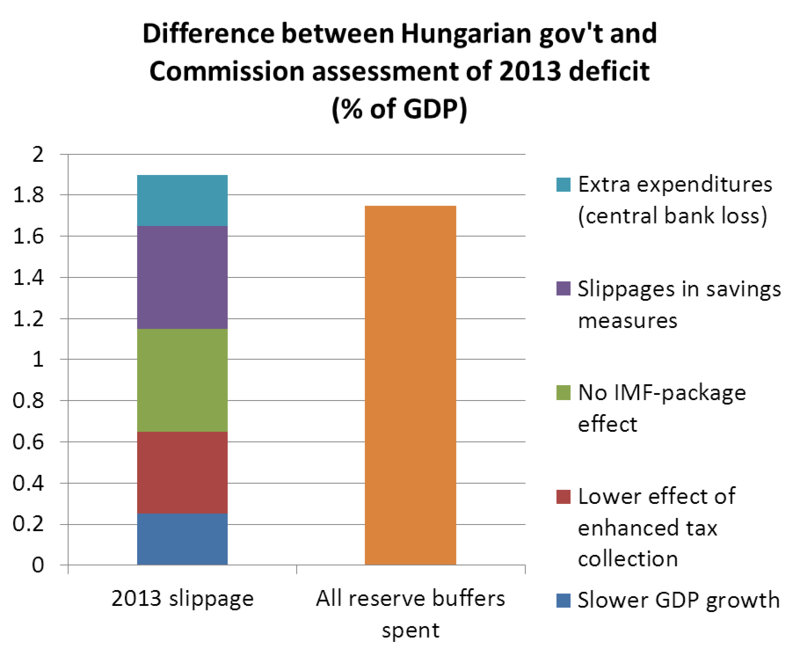 This can be interpreted as the Commission’s apparent skepticism regarding Hungarian plans, and its expectation that spending will increase in 2014 (which is, incidentally, an election year). Furthermore, this probably means that while the Commission will turns off the slapping machine, for now we have steered clear of the sanctions associated with the excess deficit procedure. However the Commission won’t remove the slapping machine from the room, but leaves it there instead – to let Hungary know where it stands. 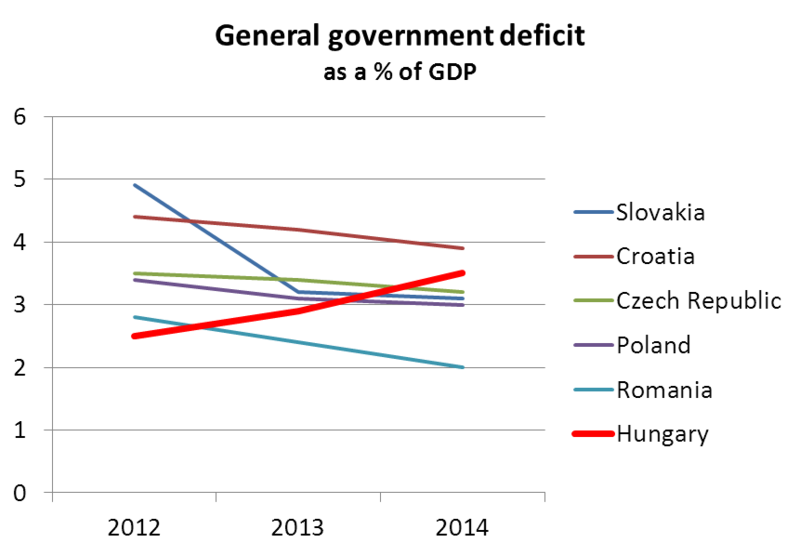 The Commission found substantial discrepancies between its own projections for 2013 and those of the Hungarian government. They believe the differences between the two will be covered by using all extraordinary reserve buffers for 2013 (equivalent to 1.75% of the GDP). Therefore, the 2.9% deficit projected by the Commission for 2013 is below the symbolic threshold of 3%, and close to the official target of 2.7%. The Commission identifies several risks that could affect the final level of the 2013 deficit. Risks potentially lowering the deficit include constraints on municipalities’ borrowing capacities, as well as the possible whitening of the economy. On the other hand, rising yields on public securities, a potential European Court of Justice ruling against the extraordinary telecoms tax and higher Central Bank losses all increase the risk of running a greater deficit. Overall, the Commission believes that the deficit can be kept under 3% with the utilization of reserve buffers in 2012 and 2013, but remains sceptical regarding deficit sustainability on the medium term. ← Oil can(’t) buy me love?